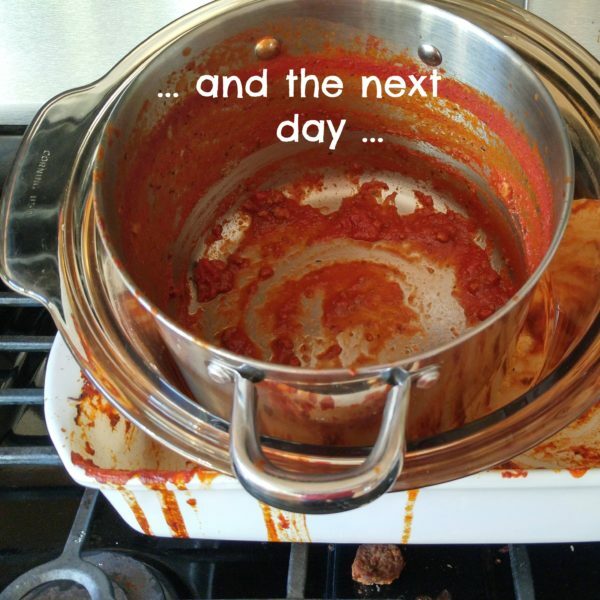 Have you ever hesitated to make a favorite dish because you knew cleanup would be a nightmare? It’s sad but facing the task of washing a lasagna pan has given me second thoughts about making lasagna. But no more! 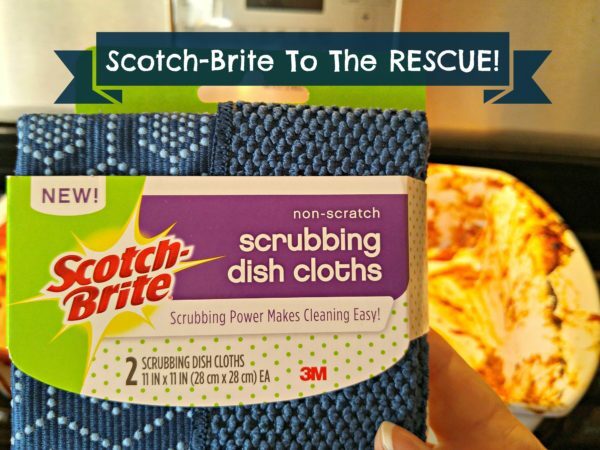 Scotch-Brite® Scrubbing Dish Cloths to the rescue. 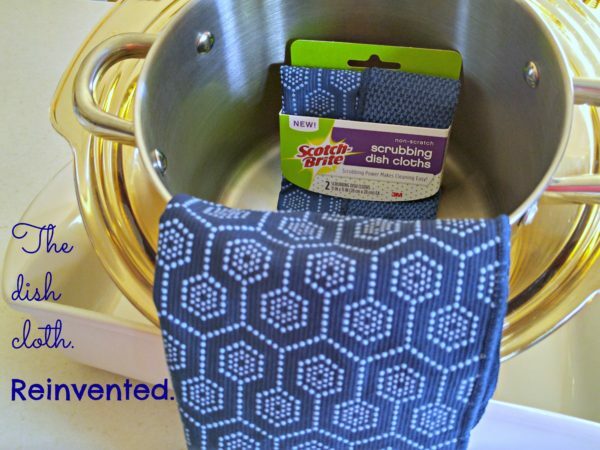 I first tried the new Scotch-Brite Scrubbing Dish Cloths for a twitter party that I hosted, then added to my collection with a special deal at Kroger. 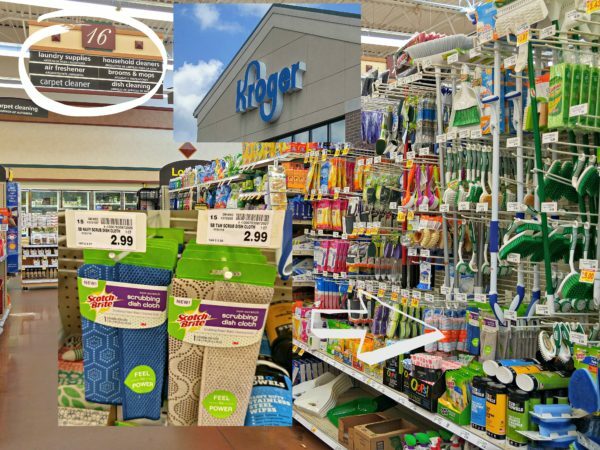 Watch for $1 off a 1 pack and $1.50 off a 2 pack of the Scrubbing Dish Cloths available in store on clips strips with the product display. Sauce Directions: Combine tomato ingredients in a large saucepan. 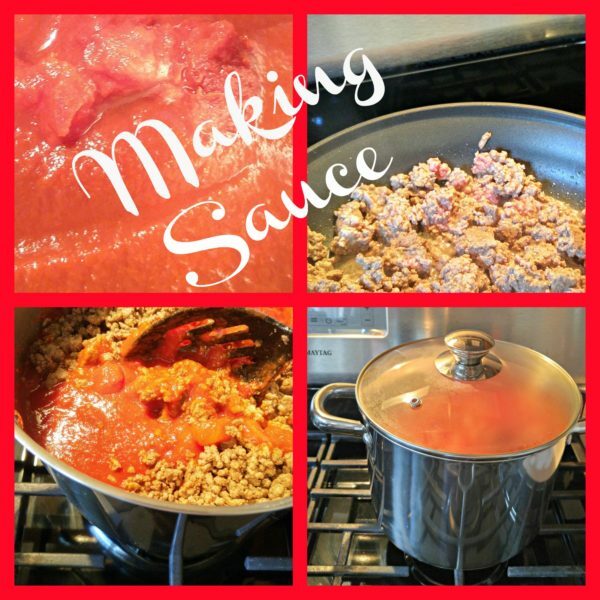 By using paste, diced, and sauce you create a multi-textured sauce. Start on medium heat until simmering, then reduce to low. Brown ground beef in a large fry pan using medium heat. Drain well and add beef to tomato mixture. Season with Italian Seasoning and salt. Season to taste with more or less based on your preference. Cook for a minimum of one hour, but the longer the better! 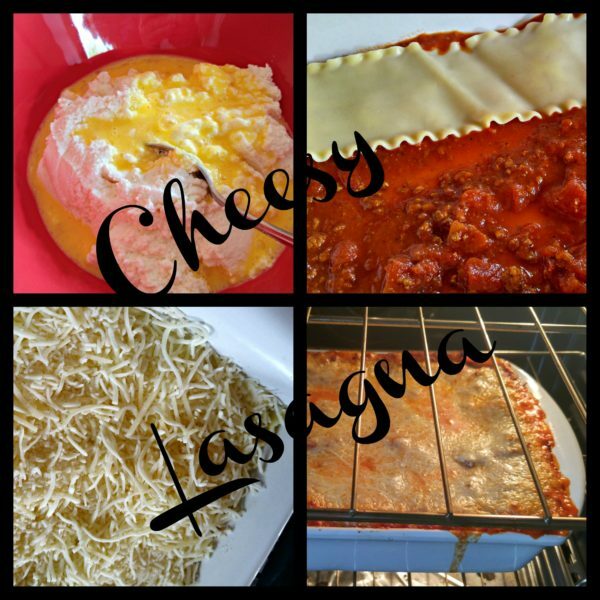 Lasagna Directions: Add lasagna noodles to boiling water and cook for 8 minutes. Noodles will not be fully cooked but should be firm. They will complete cooking during the baking process. Mix ricotta cheese and eggs in bowl. Mix shredded cheeses in a second bowl. Slice cooked Italian sausage in thin pieces. Preheat oven to 325 degrees. Assemble layers in lasagna pan: sauce, noodles, ricotta, mozzarella/parmesan, sauce, sausage, noodles, ricotta mozzarella/parmesan, sauce sausage, noodles, sauce, mozzarella/parmesan. Cover with aluminum foil. Bake at 325 degrees for 30 minutes, remove aluminum foil and bake for 30 minutes more. 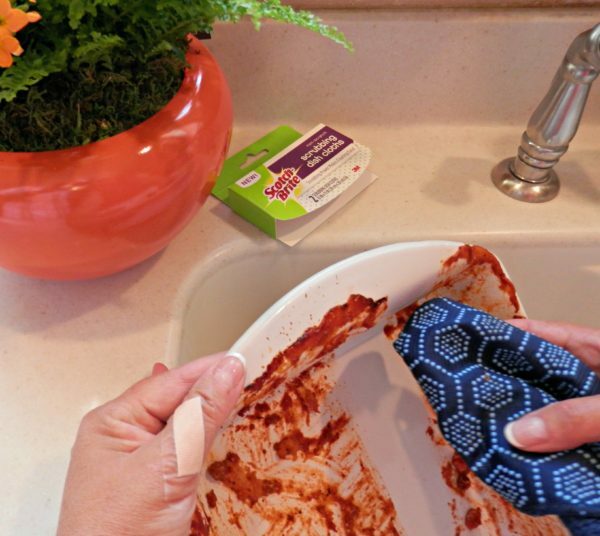 Make sure you have a Scotch-Brite Scrubbing Dish Cloth ready for cleanup after your delicious lasagna is gone! 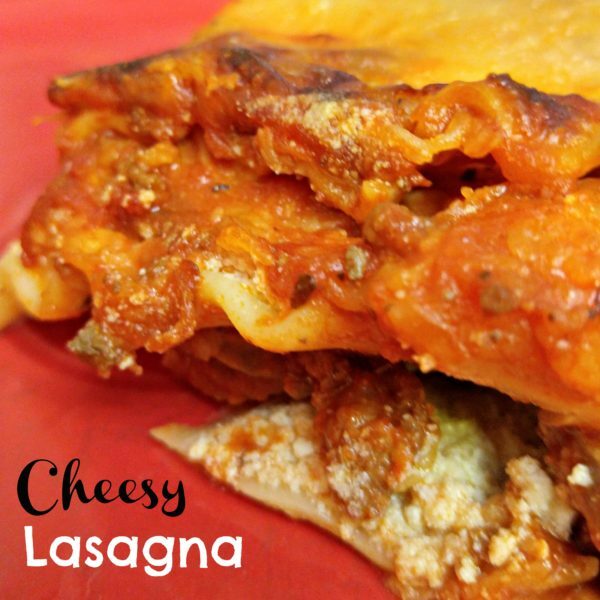 Lasagna is a perfect party dish. It can be made a day before and then reheated on party day. Serve with salad, garlic bread, breadsticks and a delicious Italian dessert like cannoli. Mangia! One of the most difficult things to do for a party meal is getting everything ready at the same time. Here is a tutorial on how to create a Menu Plan Timetable. I hope it helps at your next holiday or party! Make a list of each menu item, how long you have to cook it, prep it, and get a starting time and in-to-cook time. Start from the left and work in each number as you go, making sure activities aren’t overlapping. This is a fairly simple menu, but if you had multiple proteins and sides, this could be a lifesaver! 2. Add in non-cooking tasks such as setting the table and cleaning. 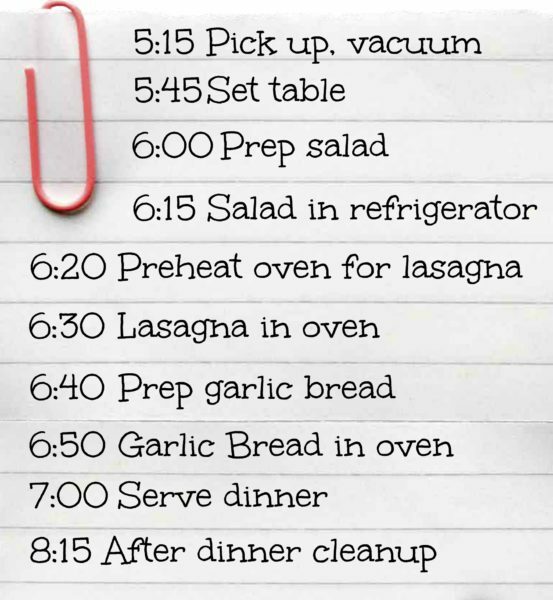 But, I have to admit, that last item, “After dinner cleanup” usually gets put off until the next day for me. I am having too much fun with friends to be spending time cleaning. And, I often forget to soak my dishes or pans. So the next day I can be facing one challenging lasagna pan! That’s where Scotch-Brite Scrubbing Dish Cloths came to my rescue. What is special about them? Scrubbing dots. 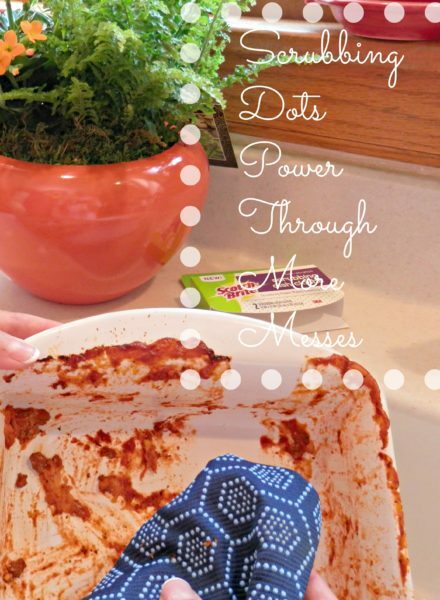 Scrubbing dots give you the power to get through tough messes. Washes dishes or pans is definitely not on my list of fun things to do, but it can be more pleasant if my kitchen is clean and bright. Scotch-Brite Scrubbing Dish Cloths come in great colors and designs. Shades of blue have been one of my go-to color combinations this year. The Scrubbing Dish Cloths in navy and light blue looks crisp and fresh. They are available in 2 packs in grey, mint, tan, and navy for at Kroger for $2.99 for a 1-pack and $5.49 for the 2-pack. Check out what other great recipes and cleaning tutorials bloggers have to offer here. I haven’t seen those dishcloths yet, but they look really handy. Thanks for telling us about them.